NEW HAVEN — Outshot, outscored and outplayed during the first two periods of its Division I hockey final against Greenwich, Fairfield Prep knew time was running out on it to get its game in gear and add another state title to its collection. So Kevin Oricoli and Evan Uva made sure the Jesuits didn’t waste any time in taking the lead and turning the tables in their favor in the third period. Oricoli’s goal with 12:29 remaining in the third period tied the score and Uva tallied the go-ahead goal at the 11:17 mark for the Jesuits, who used the quick, two-tally spurt to get back on top of the Division I hockey scene. Two goals from Oricoli and one Uva third-period tally propelled top-seeded Fairfield Prep to a thrilling 4-2 win over second-seeded Greenwich in the championship game of the CIAC Division I Tournament at crowded Ingalls Rink. The Jesuits (22-2-1), who added an empty-net goal in the last minute of play, now have 14 Division I hockey championships to their ledger. As exciting as the victory was for the Jesuits, that’s how heartbreaking it was for the Cardinals, who held leads of 1-0 and 2-1. Senior forward Matt Baugher scored both of the Cardinals’ goals. GHS was seeking its first state title since 1992. 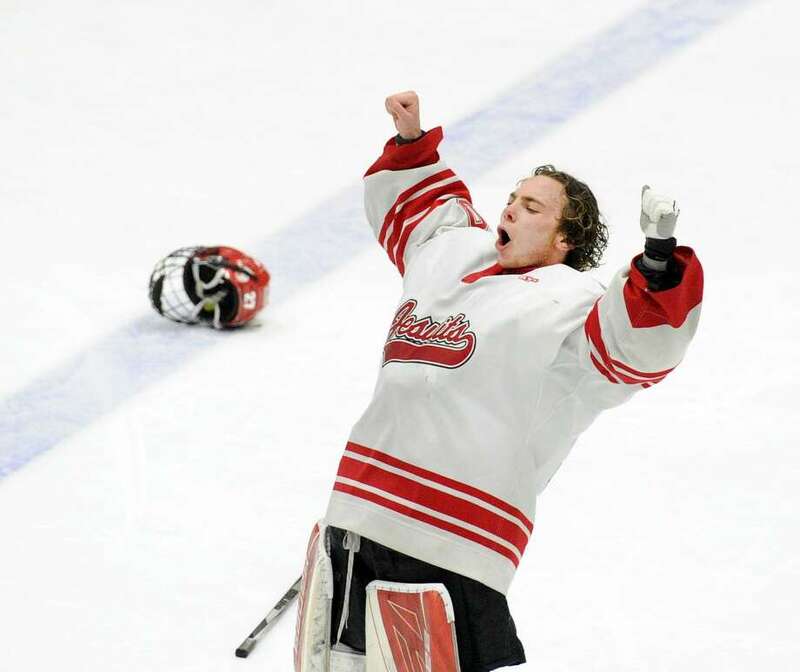 Senior goalie Jack McGee made 24 saves for Prep, while sophomore goaltender Ben Nash stopped 15 shots for the Cards. The game’s go-ahead goal occurred with 11:17 remaining in the third period. Uva sent a slop shot from the blue line that found its way to the back of the net, putting Prep on top, 3-2. Uva played the game with an injured elbow, but it sdidn’t prevent him from leading the squad to victory in the final game of his high school career. Trailing 2-1, the Jesuits knotted the score when Oricoli received a pass from Carter Kral and snapped a shot by Nash from between the circles with 12:29 left in the final period. Baugher gave GHS a 2-1 edge in spectacular fashion. Senior forward Alex Mozian slid the puck across the ice to freshman forward Thatcher Danielson, who was positioned at the right wing. Danielson moved the puck to Baugher, who from several feet below the right face-off circle snapped a shot from an extremely tough angle that went over McGee’s right shoulder and settled inside the left corner of the net, giving Greenwich a one-goal lead at the 8:55 mark of the second period. A Cardinals tripping penalty put Prep on a power play with 2:47 left in the second period, but the Jesuits couldn’t capitalize. Baugher nearly scored his third goal of the game, but his shot hit the pipe just as the buzzer sounded to end the second period. The Cards held a 9-5 shots-on-goal edge in the second period and entered the third period with a 20-12 advantage on shots. Greenwich scored the game’s first goal with 13:03 remaining in the first period. Positioned in front of the net, Baugher controlled the puck off a rebound and one-timed it past McGee’s glove inside the right post, giving the Cardinals a 1-0 lead. The Cardinals went on a power play shortly after Baugher’s goal, but didn’t extend their lead, despite applying pressure in the Jesuits’ zone. Fairfield Prep tied the score with 7:25 to go in the opening period, courtesy of Oricoli. Handling the puck inside Greenwich’s zone, Oricoli found space in between the circles and snapped a wrist shot the went past Nash and found its way into the upper right corner of the goal, making it 1-1. McGee made 10 first-period saves for the Jesuits, who were outshot, 11-7, during the first 15 minutes of play. Nash stopped six shots for Greenwich, which had the period’s only power play. Oricoli kept the pressure on the Cardinals during the first period, registering three shots on goal, while Alex Mozian had four shots for GHS. The Cardinals almost tallied the equalizer with 4:30 to go in the third period, as a shot from the point bounced off McGee’s pads and settled into the net. But the goal was disallowed, because the net was moving as the shot was being taken. Oricoli’s two goals were key for the Jesuits, as they tried to hold off the Cardinals, who came out flying the first two periods. Prep will long remember Uva’s winning goal and McGee was clutch in goal. “Kevin gave us a great effort today on both ends of the ice, Evan brought the energy to our defense and our goalie has been our best and most consistent, player all year,” Sather said. Greenwich bids farewell to seven seniors, some of whom include Mozian, the team’s leading scorer, Baugher, and defensemen Connor Santry, and Oliver Fulton and forward JT Lawrence. Prep graduates 11 seniors, including McGee, Oricoli, Uva, Kral and Cole Casl. Goals: G — Matt Baugher 2; FP — Kevin Oricoli 2, Evan Uva, Carter Kral; Assists: G — Thatcher Danielson; FP — Kral, Colin Bella, Cole Casl, Matthew Kernagha; Goalies: G — Ben Nash (15 saves); FP — Jack McGee (24 saves). I have worked as a sports reporter for Greenwich Time since 2003. Prior to that I worked at The Journal News in Westchester County, N.Y., covering high school, collegiate and professional athletics for seven years. Just a note: The first part of the first sentence is inaccurate. Prep was not trailing by 2 goals before scoring 3. The score at the start of the third period was 2-1, Greenwich over Prep. (The score had never been 2-0.) The rest of that first sentence, which is accurate, shows that the first part of it doesn’t make sense mathematically. A team couldn’t possibly be trailing by 2 goals, then score 3, and have the result be a score of 4-2. Wow. You already fixed it. Yes, sorry, that was a quick draft I put up following the game. It’s why I didn’t major in mathematics! But I caught it quickly! How can teams, which draw players from a lot of towns, feel good about winning a state championship ? Too big of an advantage ! That is an old knock on Prep, every time they win something. All kids on a team from the same town is a big advantage. They play together for a much longer time than just high school. The Prep kids work hard, are highly motivated, and well supported by their school. Want your local school to win? Match Prep’s work ethic and determinations and commitment. Funny that you weren’t around the last 3 years when Darien (twice) and Ridgefield won the D1 championship. Stop whining. After winning D1 Hockey and D1 +D2 Boys Basketball Basketball and LL in Girls Basketball for 2018,Let the Private school bashing start…..
Where do you get 14 state titles from? According to the CIAC website, they have 16 D1 titles, and 1 D2 title. Give it a rest Longo. The state has fewer and fewer schools able to field full teams. Some that can lose players to Prep schools, Catholic schools, and the like. Most of these kids were going to Prep because their dad’s went there or they were headed there because that was the Catholic school their parents chose for them. Some played pee wee hockey with each other, parents talk where they are going. Further, they see the banners at Wonderland. Finally, some kids go to Darien and they win titles too!